We just dropped pellets on Lynn’s black-purple tongue as fast as we could from the second floor of Giraffe Manor’s Daisy’s Room balcony above the Breakfast Room. Warthogs below eat the pellets that Lynn misses. 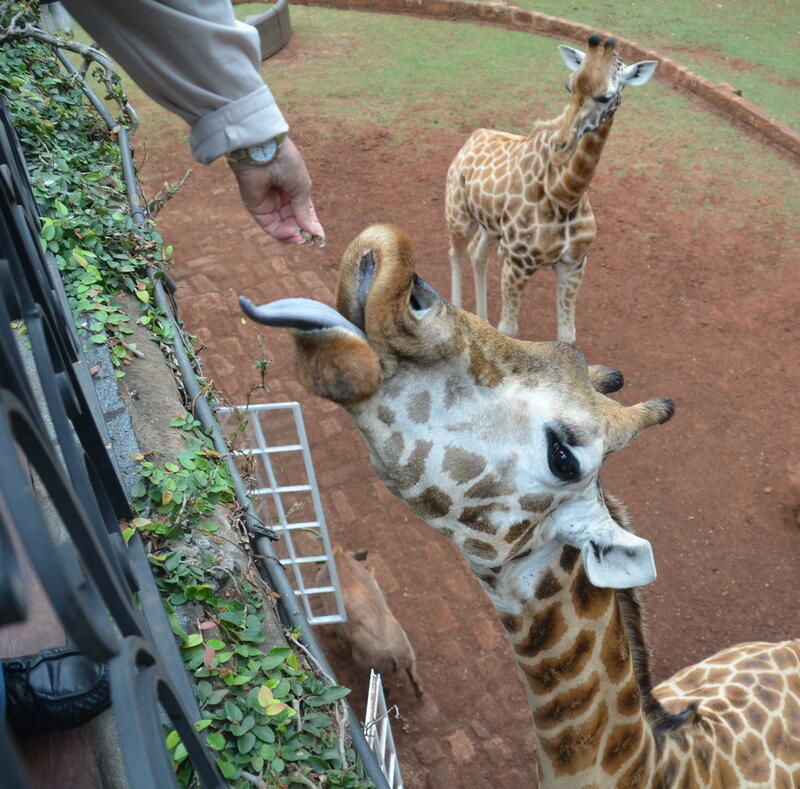 Lynn was hungry at 7 am because it was her breakfast time with 17 people feeding her pellets, giraffe pellets. She had put her head and mouth in our bedrooms, at the balconies, and on the patio to eat pellets non-stop from anyone who would feed her by hand or mouth. Now it was time for the Breakfast Room. Oh, this Breakfast food is delicious. 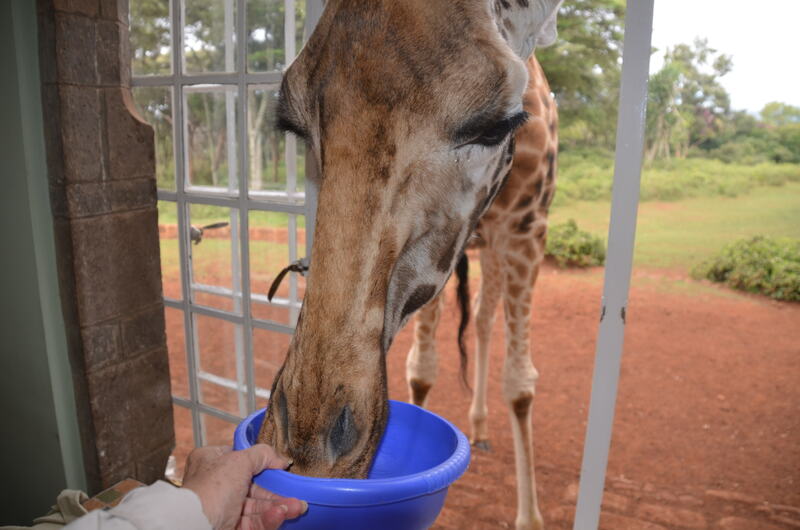 And Lynn eats several plates of pellets before she leaves to greet the tourists at the Giraffe Center. 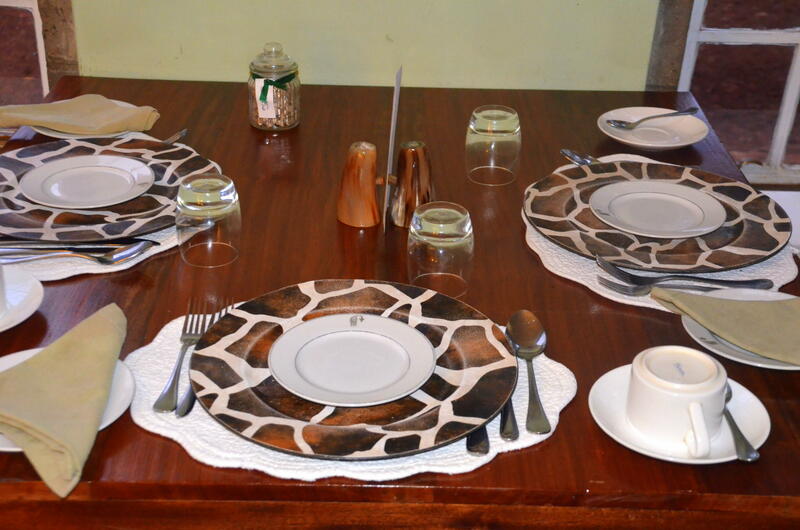 The Breakfast Room “BL” Before Lynn and her giraffe family. It was recommended that we feed her one pellet at a time but she wanted more, a lot more. She even wanted to eat at the breakfast table with us, and eat she did. She found her own plate full of pellets at each breakfast table, licked the plates and wanted more. Lynn eating off of our table and stealing a fruit shish-kebob in one second flat while we watched in shock. The fruit Shish-Kebob before Lynn. But, then, all of sudden, without warning, she grabbed my 10-inch long fruit Shish-Kebob, full of watermelon, mango, pineapple and honeydew melon, and ate the whole thing in one gulp. I screamed “Lynn, you stole my fruit.” And then, one at time, she spit out a watermelon chunk, followed by a pineapple chunk, and a mango chunk and honeydew melon chunk. It seemed like the fruit spitting would never end. And to my amazement, the chunks were in the original shape and condition. That fruit-on-a-stick was right next to my scrambled eggs on my plate. Lynn had stolen food off of my breakfast plate without my offering it. Now, my fruit-was sprinkled all over the table, and I didn’t get more fruit because Lynn had already “eaten” it. 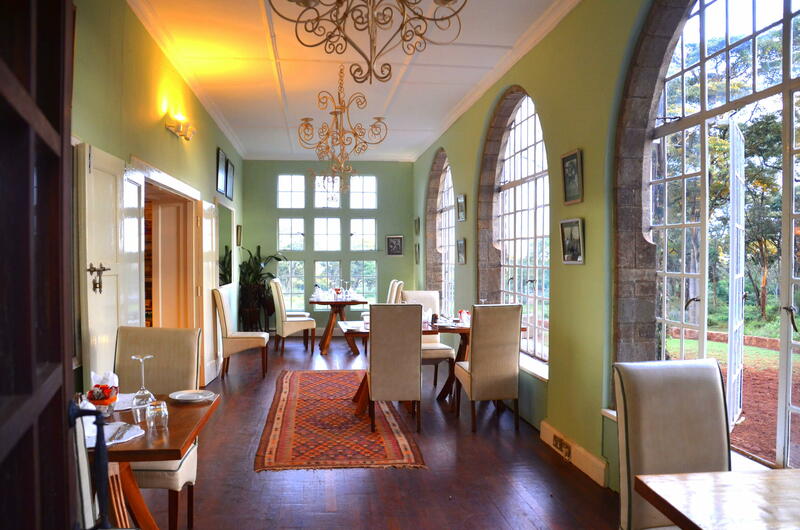 The 3 windows in the Breakfast Room can have several giraffes at each window. Lynn eating a snack right before Breakfast in the window. 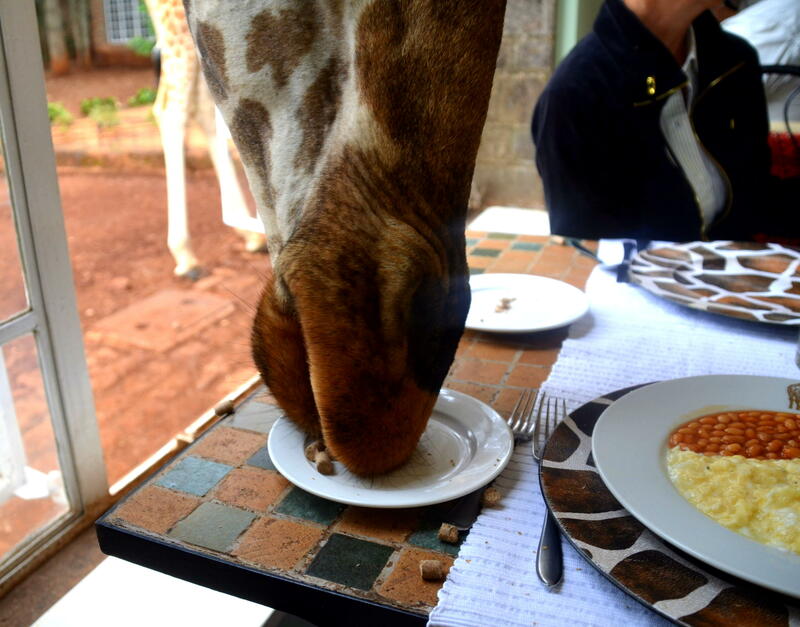 Lynn Giraffe had eaten people’s breakfast food many times as she was one of the 8 resident severely endangered Rothschild giraffes at the Giraffe Manor Hotel www.giraffemanor.com in Nairobi, Kenya. In 1974, the owners of the old 1930’s style ivy covered English manor, Betty and Jock Melville, were asked to take a baby Rothschild giraffe to help save the species from extinction. Her name was Daisy and soon, Jock, a young male giraffe followed and many baby giraffes thereafter. 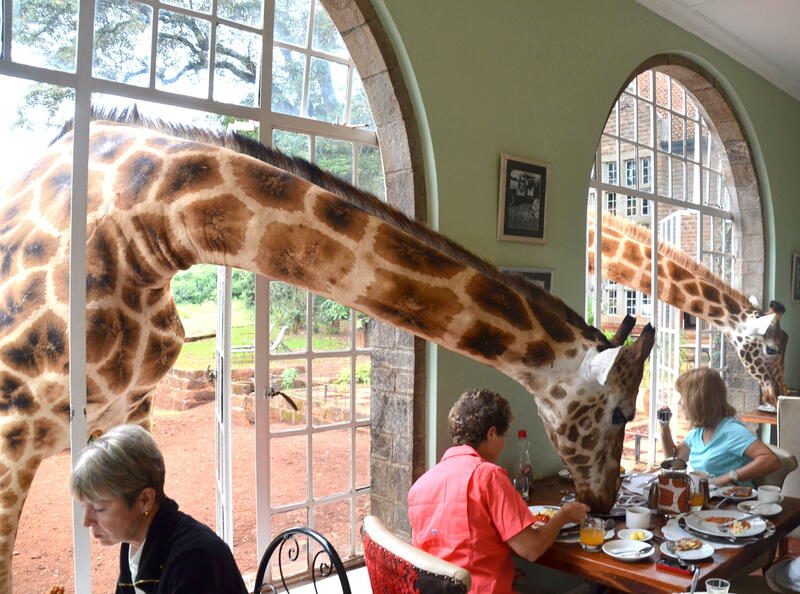 Betty always loved feeding her 2 giraffes at breakfast through the open windows and a tradition began. 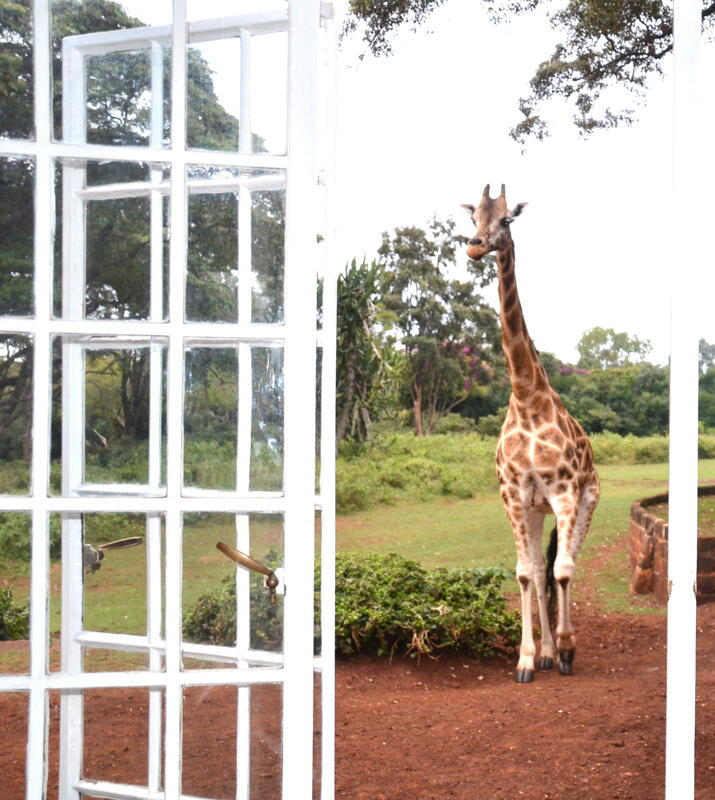 Calling the Rothschild Giraffes from the surrounding 140-acre complex in the Karen subdivision of Nairobi, Kenya. Here comes Lynn for Breakfast, and the windows were perfect height for her13-foot height. 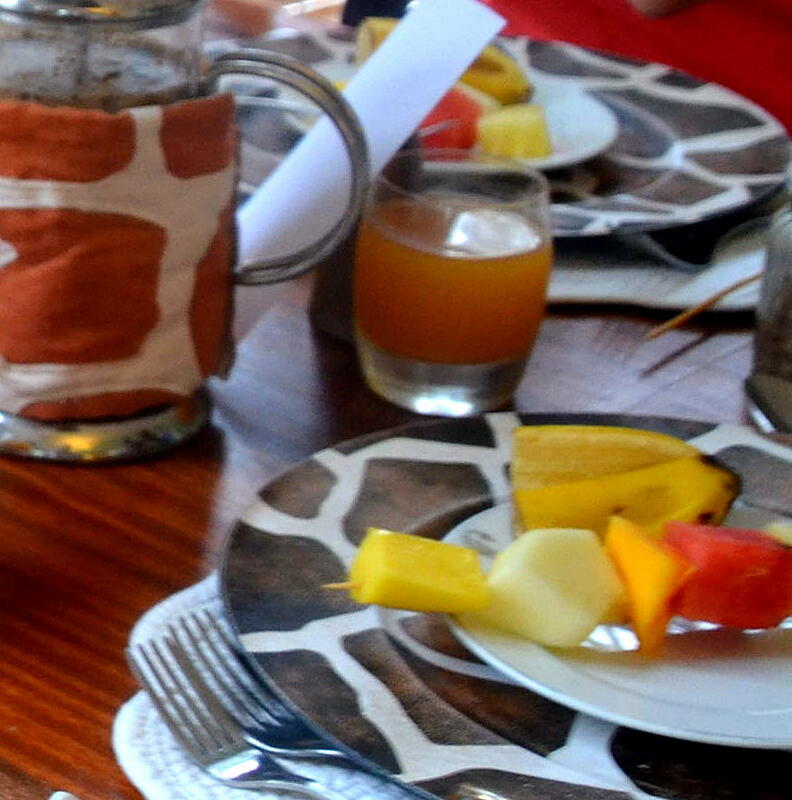 Now, Giraffe Manor is the only hotel in the world where a giraffe eats breakfast with guests. 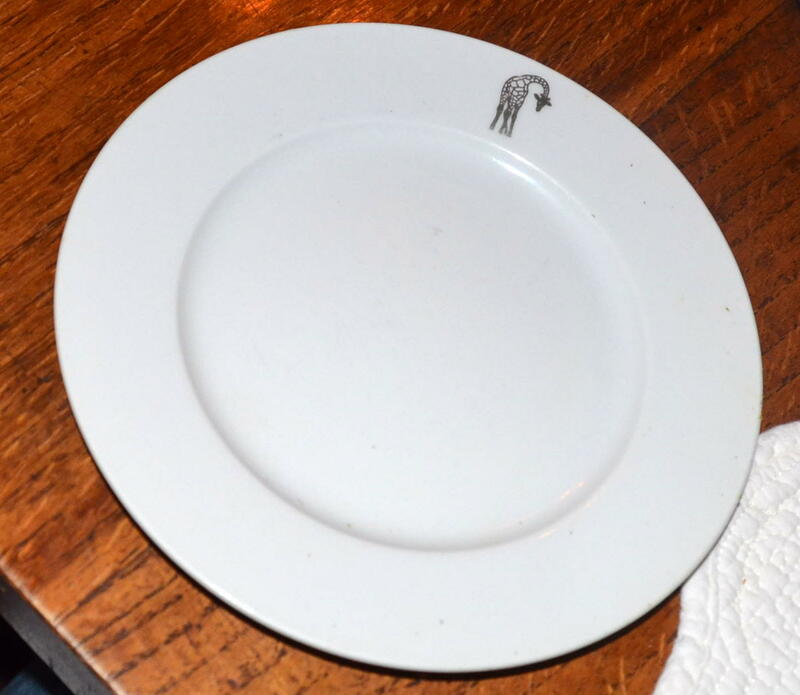 To call the giraffes to breakfast, a hotel employee stands near the Manor’s front door around 7 am and rattles a plastic bowl full of giraffe pellets. THE food in THE cauldron in THE Fireplace in THE Reception Living Room. 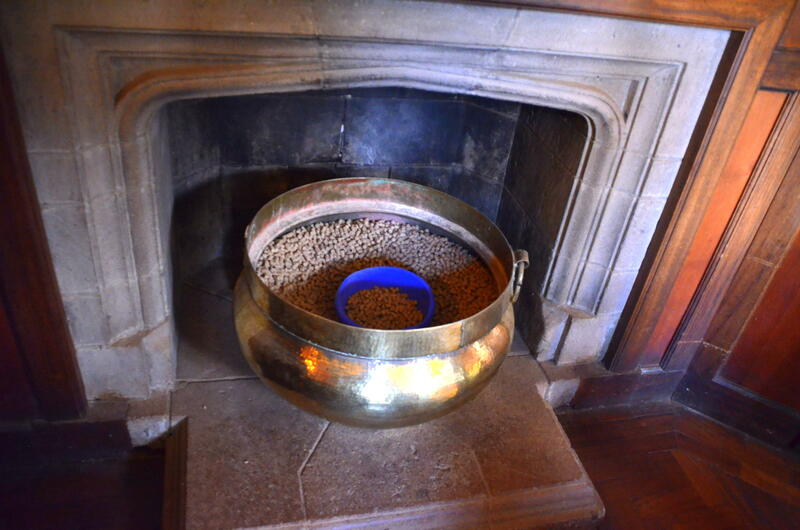 The pellets come from the Manor’s reception room fireplace where a huge brass cauldron full of giraffe pellets awaited for feeding them. In one minute flat, the giraffes started arriving from the 140-acre property around the Manor. Lynn picks up the pellets that were dropped and the Giraffe Manor’s resident warthog family eats the pellets on the ground. 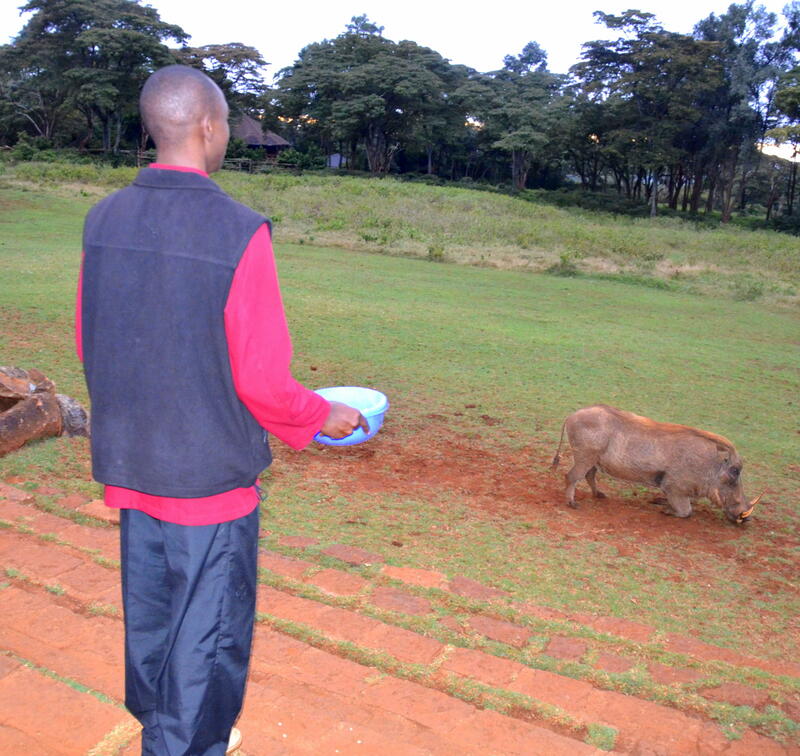 The warthogs get on their knees to eat the food. Hand feeding wasn’t fast enough. Lynn wanted a bowl full at a time. 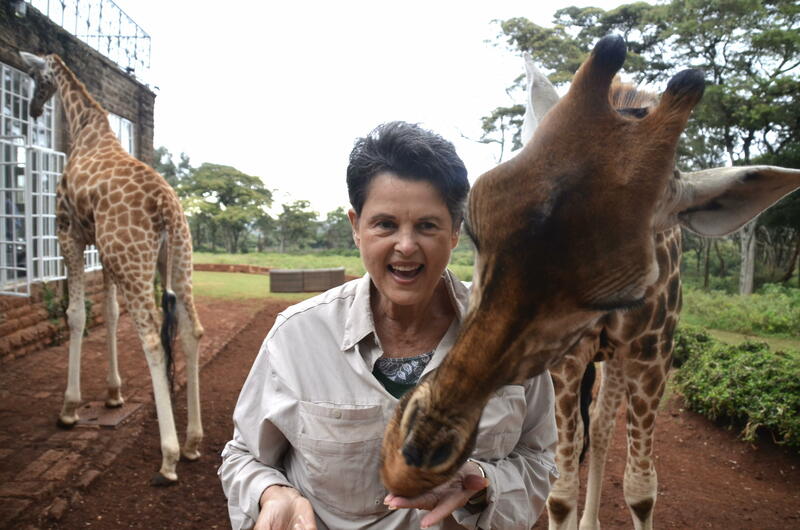 Soon, we were surrounded by giraffes, each with a name like Jock, Marlon, Betty, Daisy, Lynn, and Karen in honor of Karen Blixen who wrote “Out of Africa”. 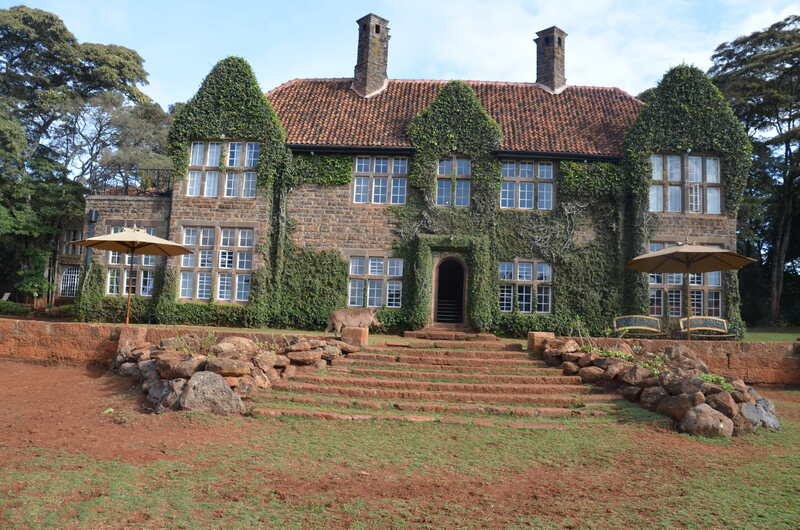 The Manor is located in the Karen section of Nairobi and Ngong Hills. In honor of each giraffe, the Manor’s bedrooms were given their names. 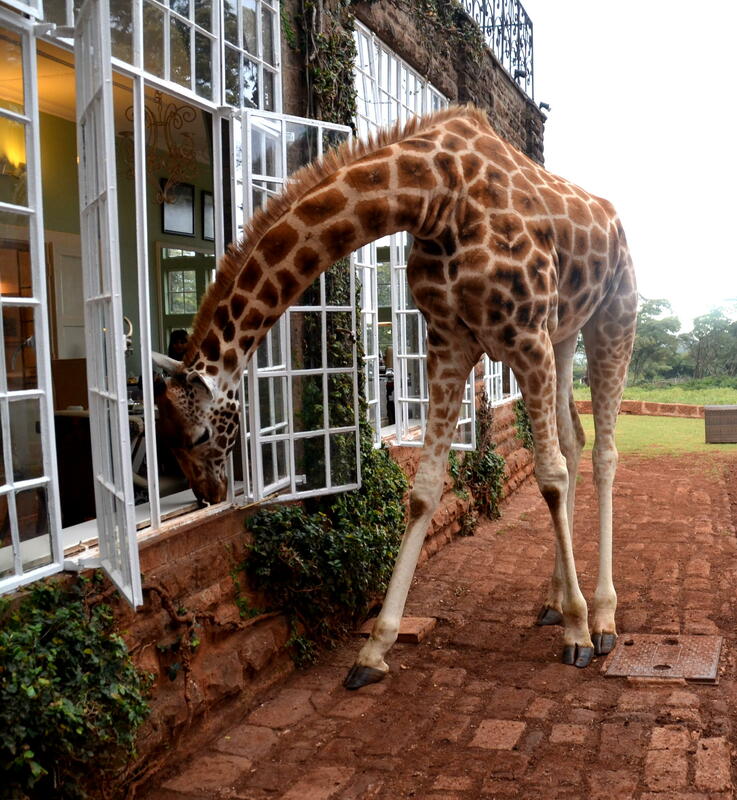 We stayed in Daisy’s Room that had a balcony and Lynn Giraffe came around to eat our pellets at the balcony railing. It was the first time I had even seen her long, deep mouth and black purple tongue, and teeth. She just stood with her head pointed to the sky and mouth wide open, and I dropped pellets in her mouth. She would also come back for more pellets in the afternoon for tea and evening for dinner on the terrace. 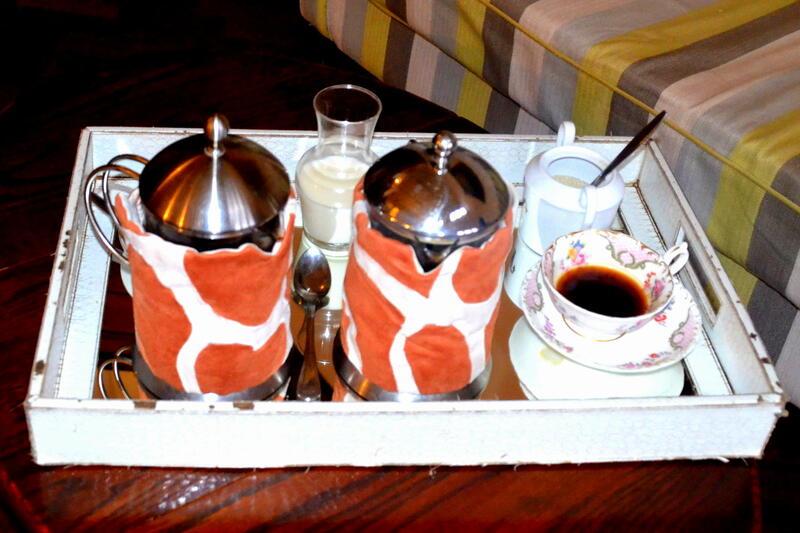 Staying at the Giraffe Manor was an awesome experience that we highly recommend for a giraffe experience of a lifetime. 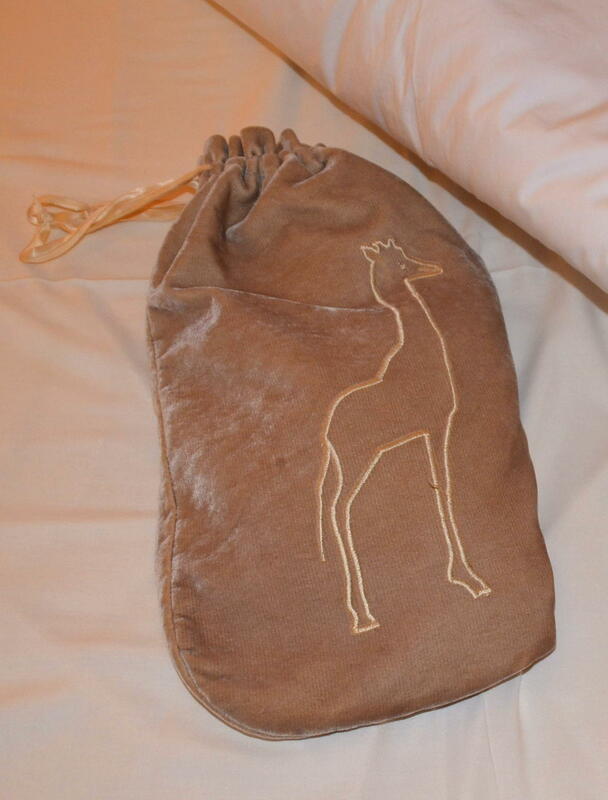 Plus, giraffes are everywhere inside the Manor from the photos and paintings on the walls, to giraffe dinner plates and chargers, to hot water bottle bed warmers with a giraffe on it, coffee and tea pots with a giraffe pattern cloth wrapped around them to keep the liquid hot, and a gift shop with, you guessed it, giraffe items for sale.